Is the Ragdoll Cat Right For You? The following experiences of living with Raggies were submitted by seasoned Ragdoll owners to help potential owners understand the breed and what it is really like to be owned by one. They know now that with the good, comes the bad! They are all true and in most cases are very funny, but there is a serious side, in that taking on a Ragdoll is like nothing else you have ever done, so you need to be prepared to cope with all that Ragdoll ownership entails. If you read nothing else today, please read this, because it really does sum up Ragdoll ownership in the best way possible. Happy Reading! Raggies shed hairs ............ a lot. Raggies do need grooming, all the time, despite what all the books say. Toes poking out of the bed at 4am are a viable target for biting. If you're trying to do something where you need to concentrate, i.e. re-wire a plug, do your homework etc. they will try to help. Raggies make excellent hot water bottles, even in the middle of summer. Anytime is playtime to a Raggie, regardless of what time it is! Slippers are for putting things in, namely bits of paper, toys etc. Water bowls are designed to be tipped over! Raggies do scratch - I am walking proof. Klingons! Ragdolls often leave the litter tray with poo attached! If it moves it's fair game! If it doesn't move............why not? If I stick claws through net curtains how fast can mummy run the distance to un-attach? Any open door or drawer WILL result in a Raggie meowing to be be freed 5 minutes later. Once you have acquired comfy seat on sofa to watch movie, ALWAYS ensure you have enough drink and snacks to get you through or you WILL lose your warm comfy seat to said Raggie. They like to be involved in everything you do - including bathing! A Ragdoll flop occurs wherever and whenever, but most usually in your way! That those big blue eyes really can get whatever they want. That Ragdoll cat bellies are for rubbing. Your bed is no longer your own, and how dare you even try to suggest to a Raggie that you want them to move over so you can get in it! No matter how quietly you think you've opened a tin of food or the tin of biscuits.. you still need to stand clear of the stampede! Fur lined everything is not optional! It just happens anyway! Don't expect to get a clear view of the PC monitor while raggies are awake. The mouse cursor must be chased! Your friends think you've gone totally mad as all you do is talk about Raggies and how wonderful they are. Its not an option either, you just can't stop yourself! They should come with an addiction warning! You will never wear black clothes again - cream/white is the new black! You will never leave your back door/front door/windows open for fresh air in the summer - raggies are like houdini trying to get out! You will never be able to cook/eat a piece of fish/chicken in peace ever again. Raggies think they are invisible - this applies mainly when trying to steal food from your dinner plate - yes we can see you! Raggies will charge at you when you try to eat anything wrapped in silver foil - particularly Kitkats and Roses/Quality street! My collegues call me 'Mummy Monty' ! - yes,middle aged women!! Even guests can expect to be escorted to the loo when they visit! You feel guilty everytime you leave the house as there is always at least one pair of blue eyes looking at you pitifully! You need to buy waterproof flooring ... Raggies love sticking their paws in their water bowls and splashing! I never thought Tess would climb the loft ladder, but she did and getting her back down was a nightmare. We ended up having to get her basket in the loft, which she will get into readily. I then had the task of combing all the bits of fluff out! Mental note made not to leave the ladder down when she's about. When you're having a private moment with your other half in bed, they'll jump up and meow loudly in your face! There is no such thing as a private cuddle in our house. Raggies will lie at the bottom of the stairs waiting for you to fall over them. People owned by Raggies are at serious risk of heart failure, if anyone leaves an outside door open. More risk occurs when said owner runs around the house in search of Raggies which have gone to sleep in the only place you didn't consider looking in! More risk of looking like you need some pyschological therapy when tearing around the garden calling Raggies' names and panicking in sheer terror, only to find your Raggie half an hour later curled up, totally oblivious to it all, in the open draw under the bed!! No matter which make of cat litter you buy, it still smells! Vases of flowers have to be destroyed, Raggies don't give in until they are! Its no good running out of the usual brand of food and thinking you can give them a tin of something else from the local shop.... it plays havock with Raggies tummies, resulting in worse smells from litter trays, not to mention unpleasant sound effects! You no longer have a show home, if you ever had one before. Toy mice, toy fish, bottle lids, bits of paper, (often wall paper!) fluff, cat litter and cat food, which obviously tastes far better after being lifted from food bowl onto the floor, can be found scattered everywhere! Window restrictors may be child proof but they are not Raggie proof! If it's on the bedside table it won't be for long. Your glass of water was made for sharing, especially when you're asleep, but you don't realise until you drink some and find loads of hairs floating in it! Your reading glasses will never be safe again. You can never ever read a book on your own again, without a little Raggie climbing up under the book looking for attention. If you are on the loo, Raggie wants to come on too. Mummy's head is for sitting on! Owning a Ragdoll is like having a child that never grows up (not good especially at 4.30 in the morning. If you won't get up, said Ragdoll is going to find one hundred and one ways to make sure you do. Garfield has got nothing on Cadbury but we can't help laughing at him. Raggies like to chew wires - we are on our third telephone in 9 months (and Cadbury is nearly four now). Forget about having a bath on your own, don't know about yours but as soon as the tap starts running Cadbury is there and refuses to move until all the bubbles have gone. Raggies know how to turn on the bidet. Floor rugs will be hidden under (don't care if it's antique persian or corner shop bargain). After purchasing said Raggie ALWAYS ensure there is room in your home for at the very least 2 more! You will always have some-one to share your indulgent cream cake with. Wrapping presents are now only a vague memory.......buy plenty of pretty boxes for gifts and buy labels that clearly state.........any Ragdoll found in this gift is to be returned to it's owner post-haste. All litter tracks.................Raggies have rabbit-style paws. Laptops do give off heat so be prepared for 'Raggie a la Dell'! You'll never have a clean litter tray because they're in there as soon as you've cleaned it or even while you're in the process of cleaning it out! Whenever guests come round, expect you Raggie to go straight to litter tray and make nasty smells. Raggies are not quiet and demand attention at all times. You lovely furry rug is just a plaything, to be pulled up so that all the tufts fall out, and then just rolled all over. Clean hairless carpets are a thing of the past, especially if you dare leave them at home for a few days - when you come back there is enough fur to knit a couple of jumpers! Being rudely interrupted if you are having a private moment in bed with your other half, and expect also for them to join in and get under the covers and lick you in very strange places!!! Expect to give up your seat and be quiet when baby's (sorry Raggies)sleeping!!! Expect to be much poorer for all the toys they get through and ones you "have" to buy them anyway just because you do! Expect to waste loads and loads of time marvelling in your babies and giving them brushes and cuddles and playtimes - hours every day in fact, the more the better! You won't have any time left to do anything else! Nice, clean and freshly polished glass dining tables are just crying out for tiny pawprints! The one thing you should remember is what's yours is theirs and what's theirs is theirs and don't forget it! Raggies love to chew electrical wires and cables. You can't write anything - pens are toys, silly! Walking into the kitchen means of course that you've gone in there to feed them! If you're lying on the sofa, watching tv, you can't see - as they don't care if they lie in your view of the tv, on you. When I'm on the phone Mitsy doesn't stop meowing at me! How dare I talk to someone other than her! I don't allow my girls to sleep in my bedroom, so when my alarm goes off in the morning, Mitsy meows and meows until I come out and feed her and her sisiter! Dolly's obsessed with water, so I have to leave a tap on slow in the bathroom for her to play with sometimes. Ragdolls crave company. When considering homing a Ragdoll, if the house is empty for several hours a day and you have no other pets, it is worth remembering that a single cat may not be a happy cat. Two cats are better than one, particularly if they come from a home where they are used to company. We rehome so many Ragdolls who are exhibiting stress behaviours, because they are so lonely. Ragdolls should never be allowed to free roam. They are too trusting and do not have great outdoor skills, so are likely to come to grief if left to wander. Being allowed outside also puts them at risk of contracting incurable, fatal diseases, such as FIV (similar to HIV in humans) and FeLV (feline infectious leukaemia) As such it is important to take into consideration the security of windows and doors, especially during the summer. Ragdolls can and do climb walls and fences. If you wish to allow your Ragdoll access to your garden, then making it secure is essential. Indoor cats require exercise and need climbers and toys to play with. They must be provided with litter trays, which should be changed regularly and cleaned using a safe, non-phenol disinfectant. A general rule is to avoid any disinfectants which go cloudy in water, they are poisonous to cats! Ragdolls do knot and do require regular grooming. Ragdolls do moult and will shed fur onto your furniture and carpets all the time, so be prepared for more housework! Many Ragdolls will regularly produce fur balls. Ragdolls will scratch at carpets and furniture. Like all cats, Ragdolls can sometimes develop inappropriate toileting habits, resulting in them toileting away from the tray. This can be due to a health problem, such as a urinary tract infection or a sensitive stomach, or it can be brought about by stress. Despite what has been written in the press and on some websites on the web, Ragdolls are not hypoallergenic. If you are allergic to cats, then you will be allergic to Ragdoll cats. Ragdolls are generally placid, friendly cats, but they are not necessarily 'lap' cats and as every Ragdoll has its own individual temperament, you will never be guaranteed a cuddly, lap cat. Ragdolls can be very vocal and as a breed can be quite demanding of your time. 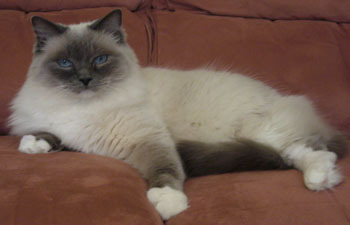 Ragdolls are said to be the largest of all domesticated cats. The males can reach 20lbs (9kg) and females can reach 12lbs (5.5kg), so before homing a kitten consider the size they may become! Carriers, climbing trees etc. all need to be extra large. Ragdolls do make wonderful cat companions, but they need a life long personal and financial commitment from their owners. A Ragdoll cat may live to 12 years, very often beyond and over that time the annual cost of feeding and caring for them will far outweigh the initial cost of buying a kitten. Please consider carefully whether a Ragdoll is right for you and your circumstances, before homing a kitten or seeking to adopt an older Raggie.